We live on 3 acres in Millersburg Pa and got started having puppies as a hobby and project for our children. We enjoy the animal care we can teach our children through this. All of our dogs have outside access to spacious meadows at all times. Absolutely NO kennel dogs. We believe in raising puppies with lots of sunshine and they are typically introduced to the outdoors around 4 - 5 weeks old and usually have full outdoor access with doggie doors by the time they are 6 weeks old. We feel this is an important part of their growth as they play in the sunshine and explore our property. Our puppies are well socialized and spend a lot of time with our children. They are all under vets care and will be up to date on all de-wormers, vaccines etc. To schedule a showing call, text or email us today. Or if you would like to reserve a puppy until you can come we usually do this through Paypal with a small down payment. 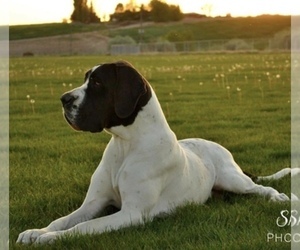 Sarah Treat is a Breeder of the Great Dane and a Veterinarian Technician. Her passion for the Great Dane breed is an extension of her love of helping animals, producing quality Great Danes that are an excellent representation of the breed standard with both, sound mind, and body. Her Husband Tyler Treat co breeds with her as a married team. Their Danes are part of the family in everything they do and are always treated with the love, care, respect, and compassion that every animal deserves. 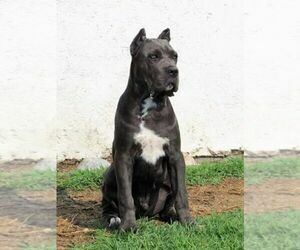 Looking for a reputable Great Dane breeder in your area? 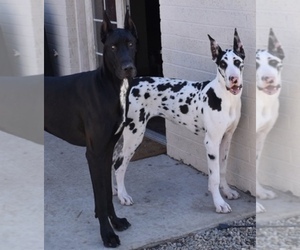 Simply browse through our nationwide directory of 1000s reputable Great Dane breeders - complete with website addresses, dog breed profiles, and current puppies for sale.